[Jesus said,] "Those who accept my commandments and obey them are the ones who love me. 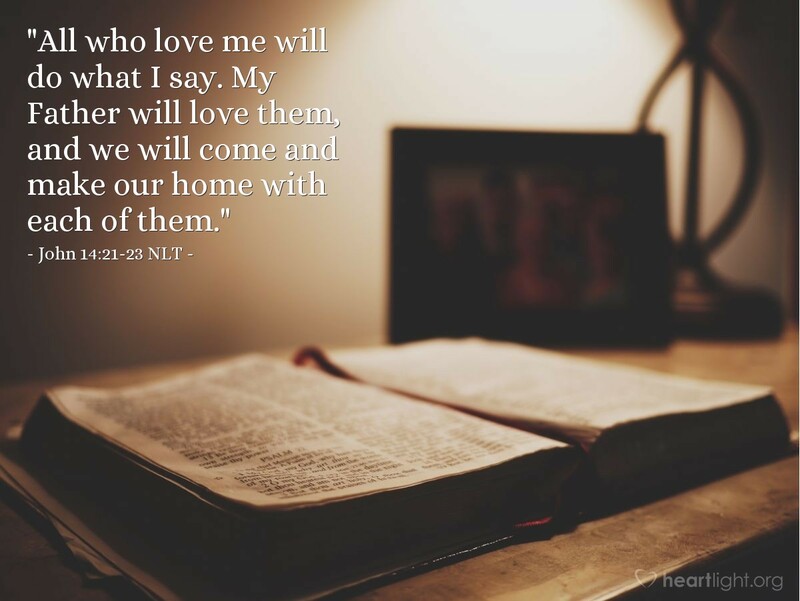 And because they love me, my Father will love them. And I will love them and reveal myself to each of them." Judas (not Judas Iscariot, but the other disciple with that name) said to him, "Lord, why are you going to reveal yourself only to us and not to the world at large?" Jesus replied, "All who love me will do what I say. My Father will love them, and we will come and make our home with each of them." Do you know how God chooses a place to live? He looks for someone who is obedient to him, and then the Father and the Son come to live in that person through the Holy Spirit. Not only do they live there, but they also reveal their presence. In other words, Jesus has gone to heaven to prepare a place for us, but he comes to live in us until we can come to live with him. Our invitation for him to come and live in us is our love for him, shown in our obedience. Holy and righteous Father, I love you and want you to inhabit my life, to mold my character, and to be pleased by my obedience to your will. In Jesus' name, I pray. Amen.